Zooms were treated with a certain amount of derision in the distant past but it wasn’t too long before their advantages became obvious to even the most sceptical commentators. Large numbers of photographers soon started replacing their 28mm, 35mm, 50mm, 85mm, 135mm and 200mm primes with just two zooms, one covering 28-70mm and the other 70-210mm. There was a loss of maximum aperture at some focal lengths but the savings in weight, money and frantic lens-changing that resulted were highly persuasive. Times change and the old-world 28-70mm zoom is now a 24-70mm, still with an f/2.8 maximum aperture and often boasting a high-speed internal AF motor. Coverage is sufficient for a full-frame sensor and therefore also accommodates APS-C sensors along the way. These are versatile lenses that can be bought once and used for many years on a range of different camera bodies. Unsurprisingly, many photographers aspire to own one of these highly desirable standard zooms that will cover a wealth of different picture-taking situations. The zooms may not be cheap but the point is that all of them replace at least three prime lenses that would have to have been bought separately in the past. Anybody who is spending a four-figure sum on a lens is going to expect a high level of performance and these zooms do not disappoint on the image-quality front. That said, none of the 24-70mm f/2.8 zooms is without its own drawback, foremost of which is likely to be an uncomfortably high mass, followed by awkward balance when attached to a modest camera body. In addition, pictures that are flash-lit using a camera’s pop-up flashgun may reveal a shadow cast by the front of the lens in wide-angle views. This will not concern professional users who prefer hotshoe or hammerhead flashguns but others should be alert to this problem. All users, however, have to be diligent when using filters and other front-of-lens accessories, especially at wideangle settings when vignetting may occur. The costs of skylights and polarisers are also likely to be considerably higher than for more modestly specified lenses. These are fantastic lenses but which is the best – and how, if at all, is their performance likely to change when the zooms are fitted onto a smaller APS-C body? Canon’s original EF 28-70mm f/2.8L USM was an immediate hit when it was introduced more than ten years ago: such was its fame that it went on to set the standard to which other manufacturers aspired. 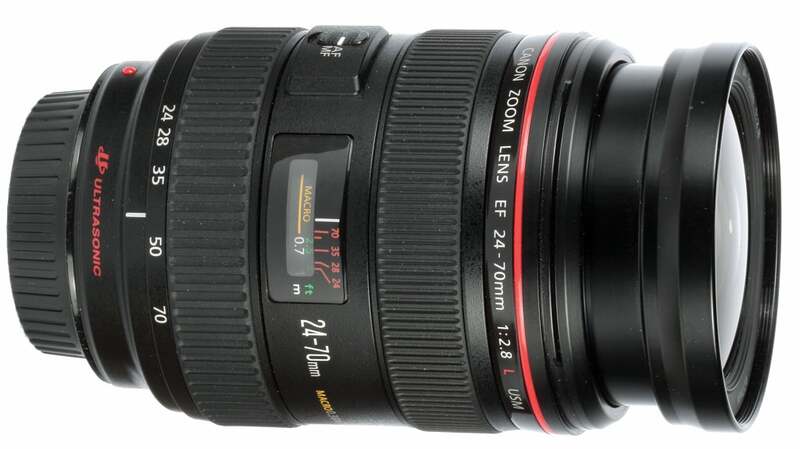 The 24-70mm version is an update of the 28mm design with an extended close-focusing capability that is marked by a ‘macro’ range on the distance scale. The lens has Canon’s traditional pro-spec feel: it nestles in the hand comfortably so that the rearmost zoom ring and the forward manual-focusing ring are both within easy reach. There is no movement of the focusing ring in AF mode and the front element is similarly static. Nevertheless, the manual-focusing ring can be employed at any time for adjustment if so desired. Automatic focusing is brisk and distortion is virtually non-existent. 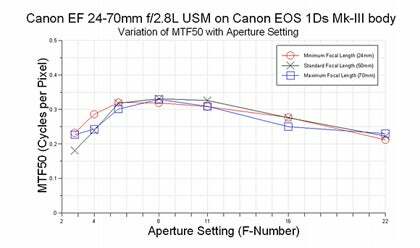 MTF performance is held above 0.3 cycles per pixel from f/5.6 to f/11 at all focal lengths and only falls below the crucial 0.25 figure when the lens is used wide-open or fully stopped-down. Given that the 0.29x maximum magnification falls a long way short of a 1:1 ratio needed for true macrophotography, Canon has been slightly cheeky in specifically designating the closest focusing distances as a ‘macro’ range (with orange markings on the focusing scale). That said, Canon has used this same tactic on other lenses and many buyers will simply interpret ‘macro’ as indicating an extended close-focusing range. As with the other lenses on test the EF 24-70mm is by no means cheap, but Canon’s clear intention was to produce a high-spec lens that will appeal to professionals who can off-set equipment purchases against both tax and clients’ invoices. Given this ambition it is worth noting that the 24-70mm has also been weatherproofed to the extent that it is described as being “highly resistant” to dust and water. Overall, there is little to fault about Canon’s EF 24-70mm in isolation but when set against the brand-new Nikkor design it falls slightly behind in terms of both focusing speed and image quality.